The first rough interferometry results for the Nepal earthquake are out, using ESA’s Sentinel-1 SAR imagery. See the initial results posted at this blog, which also contains links to more detailed geophysical and geological description of what’s actually happened. One preliminary result that stands out is that the most displacement occurred very close to the city of Kathmandu, and the fault under the city slipped significantly. The first coseismic sentinel 1 satellite results have now been processed by researchers in the InSARap project. For a sharper image of the ground deformation see our latest post. Tim Wright, CGS scientist and professor of satellite geodesy at the University of Leeds has provided a preliminary interpretation of the new results. 1. The earthquake ruptured East from the epicentre, confirming the observations from seismology. 2. Peak displacement is very close to Kathmandu; the fault under the city slipped significantly. 4. The fault did not rupture the surface. 5. Area north of Kathmandu subsides. Consistent with elastic rebound from shallow thrust. This entry was posted in Uncategorized on April 29, 2015 by WQ. The devastating earthquake that recently hit Nepal has personal relevance to me as I have been to Kathmandu twice and it is horrifying to see distinct places of the city reduced to utter rubble. Furthermore, I have a close friend and many professional contacts in Nepal, who spent their nights out in the open. We hope to see Kathmandu and Nepal rebuild and rise up again soon. As relief efforts are in full swing on the ground, here are some significant volunteer contributions we can make as remote sensing and mapping experts. If you know of any further resources or near-real-time applications for such skills, please mention in the comments. This entry was posted in Uncategorized and tagged Earthquake, Nepal, remote sensing, Satellite Imagery on April 27, 2015 by WQ. In a recently published paper in Forest Ecosystems, we evaluated forest sustainability of two forests (state and community/private owned) through quantification methods, utilizing SPOT-5 remotely sensed images for the years 2005 and 2011. 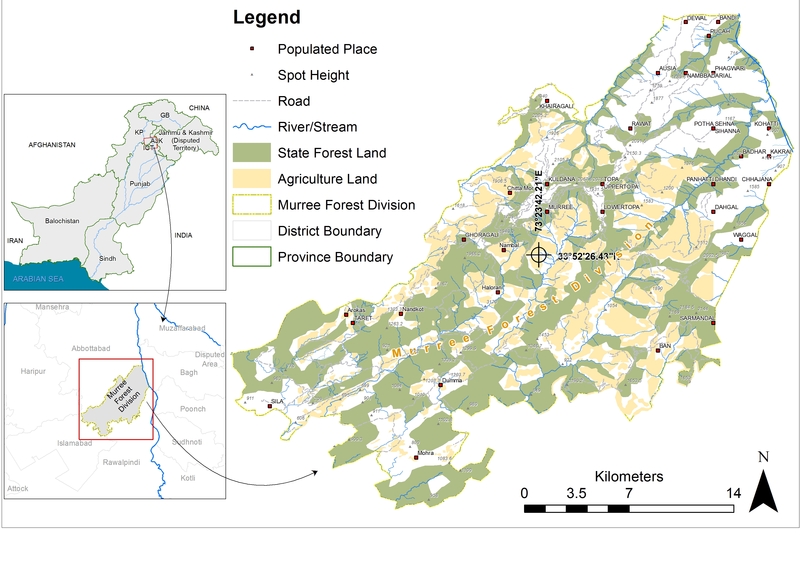 This study was conducted in a sub-watershed area covering 468 km2, of which 201 km2 is managed by the state and 267 km2 by community/private ownership in the Murree Galliat region of Punjab province of Pakistan. The results show that between the years 2005 to 2011, a total of 55 km2 (24 km2 in state-owned forest and 31 km2 in community/private forest) was converted from forest to non-forest. The study concludes that state-owned forests are better than the community/private forests in terms of conservation of forests and management. The findings of this paper may help to mobilize community awareness and identify effective initiatives for improved management of community/private forest land for other regions of Pakistan. This entry was posted in Uncategorized on April 24, 2015 by Hammad Gilani. Of late, I have been reading some scientific articles and opinion pieces regarding one of the biggest fears that I, and I am sure other scientists in the field too, face often. The fear that there may be bugs left in the trail of code somewhere that we depend upon so dearly to analyse and interpret datasets, making scientific judgements and conclusions. Here is a recent article in Nature which should force us all to re-think and re-evaluate our coding practices. Recently, there has been a lot of advocacy on making the code public and sharing it in public; however, I do think only well-documented code should be published, because a non-documented or badly-documented code can actually cause more confusion. Here is an old article in Nature which argues to the contrary. Let us know your coding practices and recommendations in the comments. This entry was posted in Uncategorized and tagged coding, Scientific programming on April 20, 2015 by WQ. Previous posts have covered atmospheric correction using the Atmospheric and Radiometric Correction of Satellite Imagery (ARCSI) software. When a large number of scenes require processing then commands to automate steps are desirable and greatly simplify the process. arcsisortlandsat.py sorts the landsat ‘tar.gz’ files into individual directories for each sensor (i.e., LS 5 TM) and also builds a standard directory structure for processing. arcsiextractdata.py extracts the contents of verb|tar| and verb|tar.gz| archives with each archive being extracted into an individual directory. arcsibuildcmdslist.py builds the ‘arcsi.py’ commands for each scene creating a shell script. The files used for this tutorial are shown below, but others could be downloaded from from earthexplorer and used instead. This entry was posted in Uncategorized on April 18, 2015 by WQ. The Central Limit Theorem (CLT) is a fundamental theorem in probability and statistics which tells us that the sampling distribution of the mean is asymptotically Gaussian as long as the sample size is sufficiently large, no matter what distribution is followed by the population. The sampling distribution of the mean has a mean equal to the population mean (μ) and variance given by σ2/N, where σ2 is the population variance and N is the sample size. Generally, the sample is considered sufficiently large for sample size greater than or equal to 30 (N ≥ 30). The variance of the sampling distribution of the mean is reduced by the factor N as the number of samples increases. The ab initio proof of the CLT is rather complicated and requires strong knowledge of the underpinnings of probability theory1. However, the CLT can be explored and understood empirically, through observations. 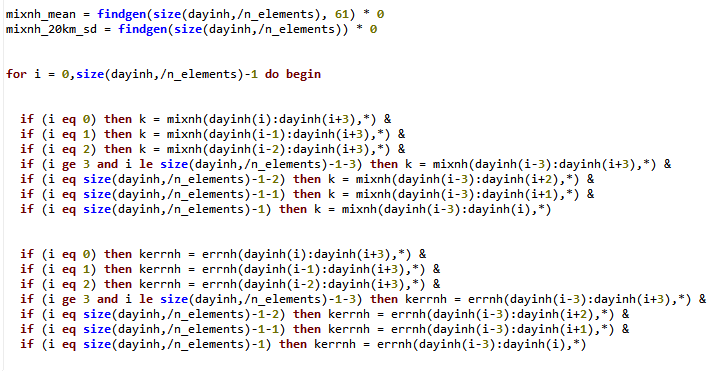 Here is a MATLAB code I wrote to explore the CLT in a graduate class I am teaching on Data Analysis for the Earth Sciences. 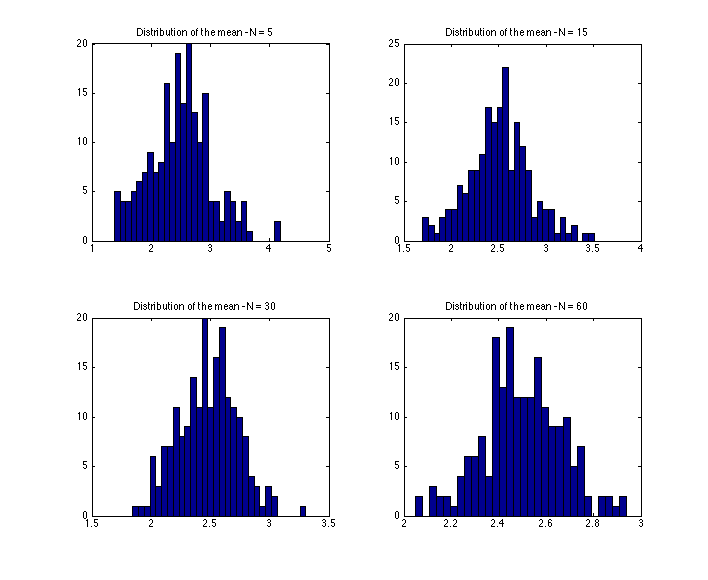 Sampling distribution of the mean with various sample size. 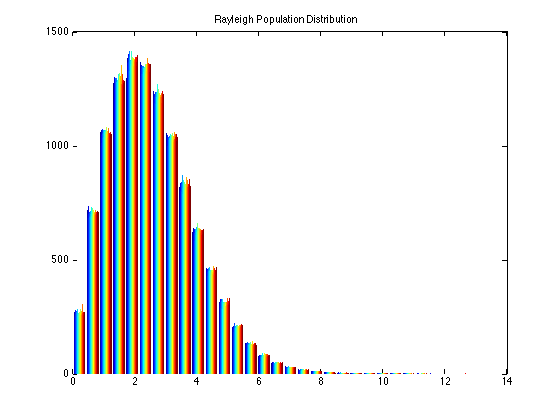 Population distribution is Rayleigh. 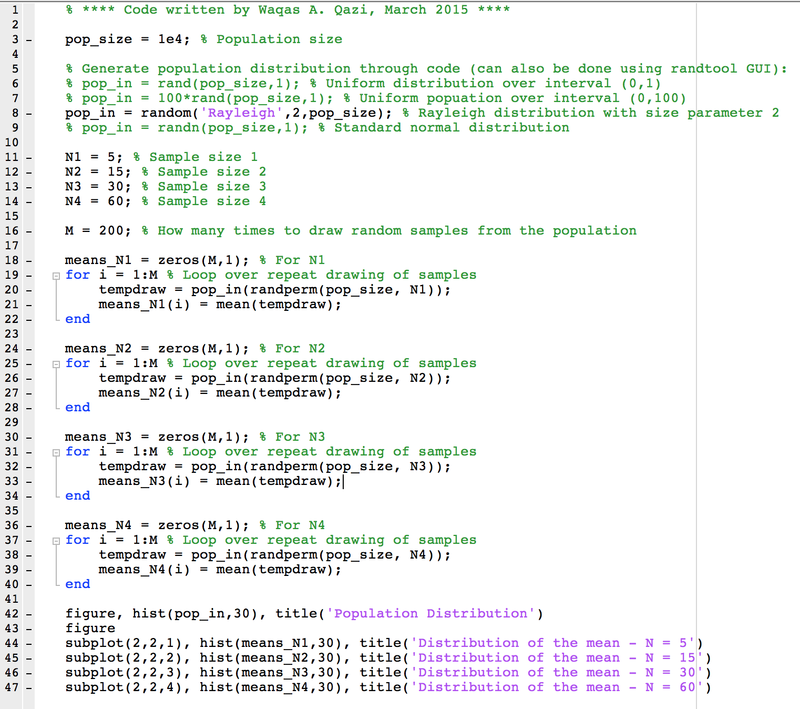 This entry was posted in Uncategorized and tagged coding, MATLAB, Probability, Statistics on April 2, 2015 by WQ.